Star Wars. And a Cheshire Cat. As you all know, I am totally not a fan of Star Wars. Like, at all. I checked my watch multiple times through the last movie to see when it would be over, actually. 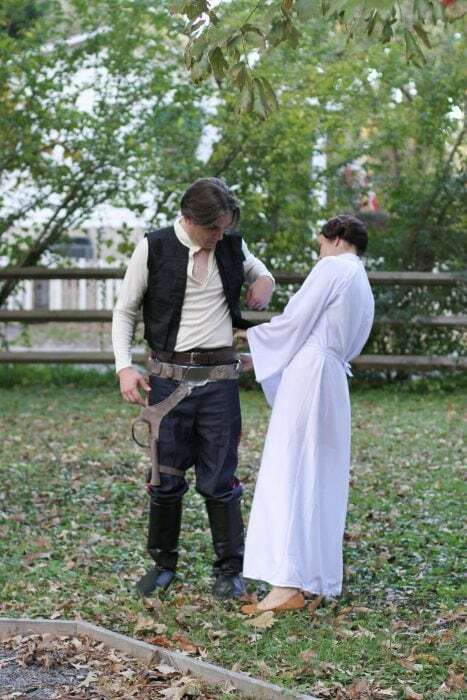 But Zoe thought it would be fun if Mr. FG and I dressed up as Han Solo and Princess Leia, so that’s what we did. You know how my kids say I am a fake fan when I wear my clearance Star Wars sweatshirt? Well, I have now become the ultimate fake fan. 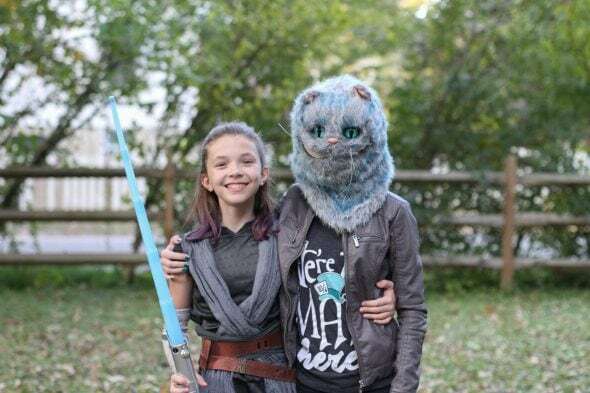 Zoe had a Star Wars costume too. So we were kind of a matching set. 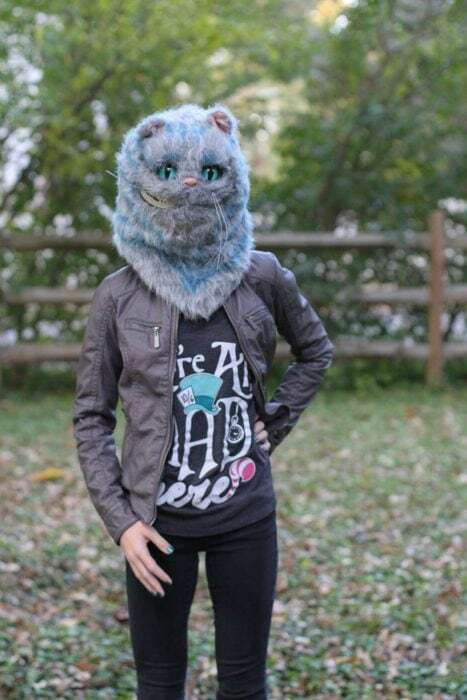 Sonia did her own thing, though…a Cheshire cat mask! So, there you go! Our 2018 costumes. P.S.Here are last year’s costumes if you’d like to take a peek. 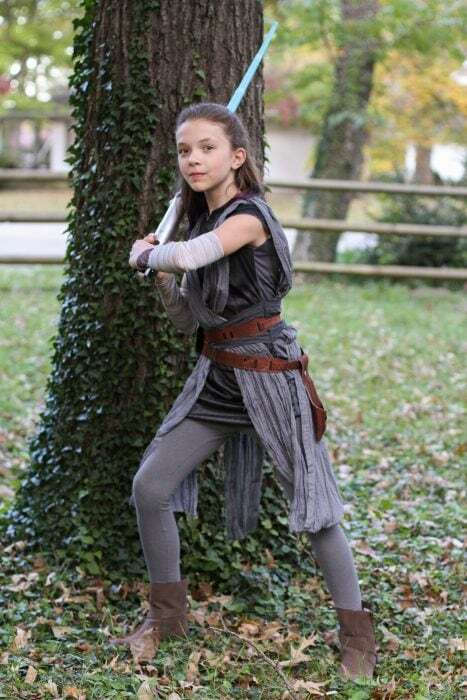 I love them all but Zoe is the best Rey I’ve seen! And I am a true, died in the wool Star Wars fan! Omggggggg I seriously don’t understand why star wars was a generation hit either. My husband’s side are all huge fans and watch all the movies multiple times. It’s not for me!! But gosh you three match those costumes so well, I mean wow!! I think you’re better looking than the original Lela too. May she rest in peace but I never thought that actress looked the role. I understand you so much! Ha. I just do not get the appeal. 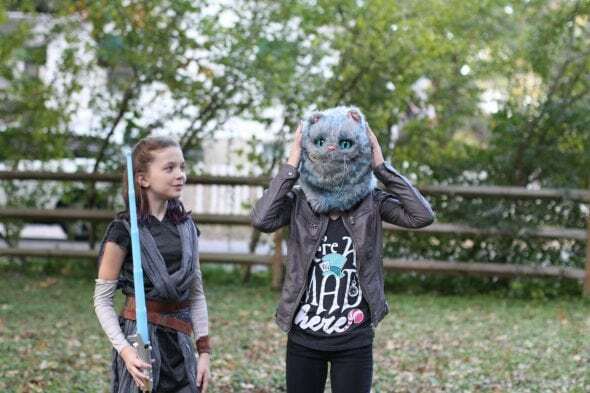 But I’m happy to dress up as Leia if it makes Zoe happy. I fit the demographics of a Star Wars fan but I am totally not one. I saw the first couple movies years ago and had no interest in going back to them. We had no costumes in our house. My daughter first kept saying she wanted to be a “Princess ballerina” whatever that means but on the day of just wanted to wear her Nightmare Before Christmas dress. So that’s what she did. Low effort, just like her dad. I actually had a mild panic attack as I got a knock on our door from Trick or Treaters for the first time in my life. There was just one problem: we don’t have any candy or any sorts of treats in the house. So I never answered the door and made sure the lights were off after that. My wife (who wasn’t home at the time) said I should’ve scrambled and found something but social anxiety and a general dislike of the celebration kept me inside. And Zoe totally looks like that character!!! We’re missing Joshua and Lisey :). I know! They haven’t gone out with us the last two years. They grow up so fast! But at least Sonia and Zoe are still young enough to enjoy dressing up. What kind of flats are those? They look wonderfully squishy and comfy on the inside. They’re from Target, actually! They’re very squishy inside, but the back heel is a little stiff right now. I’m hoping that will break in over time. 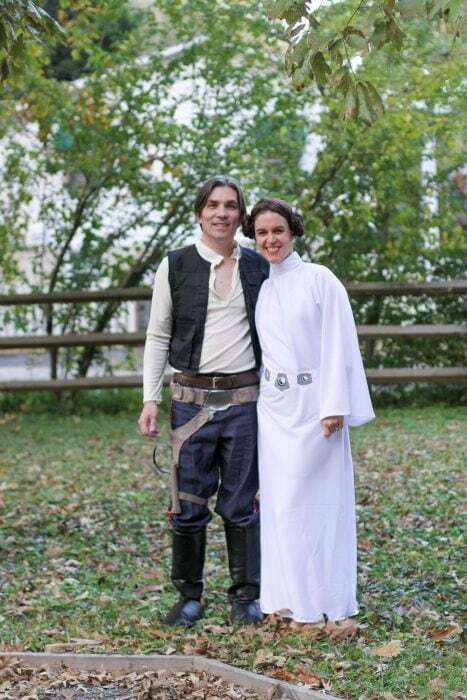 Y’all made a great Han Solo & Princess Leia! Thank you! Coordinating costumes are so much fun. Sounds like a fun Halloween at the TFG family! We had a community Halloween parade yesterday. We refused a lion costume for Baby F1 (he didn’t care). And we used his Ladybug jacket as a costume for Baby F2 (who didn’t care/know either). 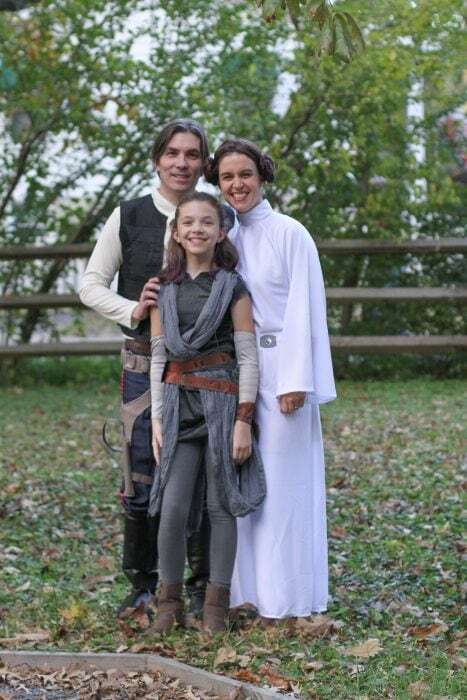 Hubby and I didn’t have a costume, but I’m seriously thinking about getting some for next year! It IS awfully fun to dress up, even as a grown-up. Especially if you coordinate costumes with Mr. FAF! I put on a warlock hat and handed out candy and pumpkin erasers to the usual half-dozen groups. I never get much traffic. Ah, our neighborhood is VERY into Halloween! So there are tons of people walking around in costume. You have to buy a lot of candy in order to not run out. Adorable! I can’t believe how fast your kids have grown up. 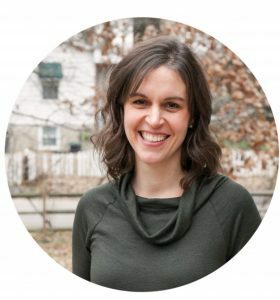 It makes me concerned that my children might grow up fast too. It’s a risk you take when you let them keep having birthdays! So do you stay home to give out candy, dressed up, while your kids go out? I never get anyone at the door where I live, so I’m out of touch. One of my daughters gets no one at her house, either, but the other one has a busy neighborhood full of trick and treating little ones. The adults don’t dress up, though. She and her husband have to split up on the taking the kids/handing out candy duties. You all look great, by the way! Well, if Joshua and Lisey aren’t around, we just leave a big bowl of candy at our door step. Mr. FG and I could split the duties, but that would be a bummer to separate our coordinating costumes! Oh my gosh. You all look awesome. And good call on the shoes for your costume!